London (AhlulBayt News Agency) - #Shia #Muslims took part in a march through #Leicester city of #England to mourn the life of one of their faith's most important spiritual leaders. Several hundred people, including women and children from the city's 1,000-strong #Shiite community, set off from Town Hall Square on Sunday afternoon. The procession, starting at 3pm, made its way along Bishop Street, Granby Street, Gallowtree Gate, Humberstone Gate, East Gates and High Street, on its way to Square. Leading the way was a giant banner commemorating the Battle of #Kabala, in 61AH of the Islamic calendar (680AD), in what is now Iraq. It was a fight which saw #Imam #Hussain, grandson of the #ProphetMohammed (PBUT) and third Shia imam, martyred at the hands of tyranny Yazid I, the Umayyad caliph. His martyrdom is remembered in the Shia festival of #Muharram. Syed Jafar, who helped organise the event, said: "It is the 28th year we have held the parade here. I remember being here for the first one all those years ago." "It is a very important holy day. Imam Hussain refused to bow down and pay allegiance to tyranny. He represents truth, justice, kindness, love, humility – all things good. 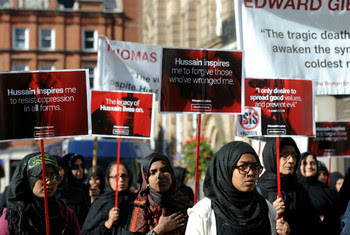 It's a message Shias keep alive and continues to inspire million across the world." A further Muharram commemoration event will be held at the Masjid-Al Husayn mosque, in North Evington, on Wednesday.